FAYETTEVILLE, Ark. 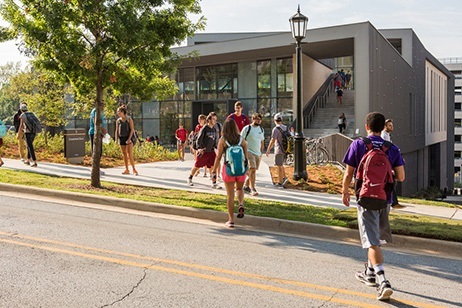 — University of Arkansas academic and athletic leaders together dedicated Champions Hall, the first new classroom building on campus since 2007, in a ribbon cutting ceremony at 10 a.m. Tuesday, Sept. 15. The 62,000-square-foot structure cost $26.5 million to build and equip. A significant amount of the funding was made possible by the U of A Athletics Department, which committed a portion of the university's annual share of Southeastern Conference revenues to the project. Those funds will be used to pay off approximately $18 million in bonds that were issued to build the Champions Hall. The four-story building houses nine general purpose classrooms, 12 biology labs, and the Math Resource and Teaching Center. The center includes a testing center, office space for many of the math teaching faculty and a teaching center where students can study and get help with mathematics. Nearly all U of A undergraduates are required to take introductory math and biology classes to meet core curriculum requirements. An estimated 8,000 students will take math classes in Champions Hall this semester, with another 3,000 students using the biology labs. An additional 2,700 students will use the general purpose classrooms. In addition to the classroom, lab and office space, Champions Hall is also the site of an impressive display of public art, selected by the university’s Public Art Advisory Committee, with the help of Marc Mitchell, assistant professor of art. The artwork includes two pieces by Seattle artist Allison Kudla on the first floor, which were purchased specifically for Champions Hall. The university also commissioned three works by the artist Lenore Thomas, who teaches at the University of Pittsburgh. These are displayed on the second floor. The sculptures Crystal Meteorite Shower hang above the lobby on the third floor. These were also commissioned by the U of A and created by Carson Fox, who lives and works in Brooklyn, New York. There are 18 embroidered shapes on cotton fabric that can be found on the fourth floor, part of New York City-based artist Allan McCollum’s Shapes Project. Two pieces by New York City conceptual artist Hank Willis Thomas are exhibited in the fourth-floor atrium. Champions Hall, at the intersection of Duncan Avenue and Dickson Street, hosted its first biology labs during the second session this summer. The building was designed by the Fayetteville firm of Miller Boskus Lack Architects with the SmithGroupJJR of Phoenix, Arizona. The contractor for the project was Nabholz Construction Services.